Preheat the oven to 220˚C. Place an oven tray in the oven to preheat. Brush the base and side of 4 by 250 ml (approx) ramekins with butter to grease. Sprinkle the flour or breadcrumbs in the ramekins and rotate to coat each base and side with breadcrumbs. 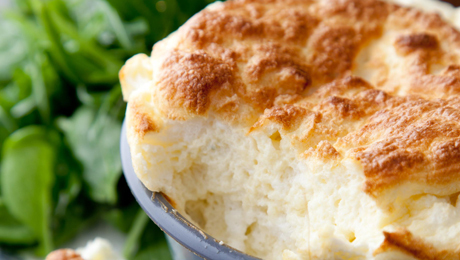 Turn ramekins upside down and gently tap to remove excess crumbs. Melt the extra butter in a saucepan over medium heat until foaming. Add the flour and cook, stirring, for 2 minutes or until mixture bubbles and starts to come away from the side of the pan. Remove from heat and add half the milk. Whisk until mixture is smooth. Add the remaining milk and return to the heat and cook, stirring, for 3 minutes or until mixture boils and thickens. Remove from heat. Add the cheese and pepper and stir until cheese melts and mixture is smooth. Add the egg yolks and stir until well combined. Season with salt and pepper. Use an electric mixer to whisk the egg whites in a clean, dry bowl until soft peaks form. Add one-quarter of the egg whites to the cheese mixture and using a metal spoon to fold through until just combined. This will loosen the mixture. Add the remaining egg whites and gently fold until just combined. Divide the cheese mixture between the 4 ramekins and smooth the tops. Run your finger around the inside rim of each ramekin, about 2cm into the soufflé (this will help the soufflé rise more evenly).